The flavour of wine is determined to a large extent by volatile compounds that are perceived during consumption by the sense of smell. The overall flavour of a wine, as well as specific flavour notes, is provided by dozens of chemical compounds of widely varying potency and concentration. The key volatile chemical compounds causing some flavour properties of wines such as ‘stone fruit’ are not known, and this project aims to better understand ‘tropical fruit’ flavour in Chardonnay, ‘green’ flavour in red wines, and the viticultural and winemaking influences on the concentration of the compounds, including the ‘black pepper’ compound rotundone. The sensory properties and consumer preferences for wines with different levels of these flavours is also an important aspect of this project. Several lactone compounds have been investigated to assess their contribution to ‘apricot’ or ‘peach’ aroma in Chardonnay or Viognier wines. Lactones are understood to be key flavour compounds in peach and apricot fruits, and in peach flavour formulations. The aroma detection threshold of a little-studied lactone was determined, and found to be approximately1 µg/L in white wine, with some people able to detect it well below this concentration. An accurate and precise GC/MS analytical method was developed and validated, and the concentration of this lactone in a set of wines with known intensities of ‘stone fruit’ aroma was analysed. A regression model was generated to relate the volatile composition of the wines to the sensory properties, and the results strongly suggest that this compound could be contributing to this important sensory attribute. Work conducted as part of a visit with Prof. Philippe Darriet’s research team at ISVV, University of Bordeaux, assessed a technique known as recombination-GC, using HPLC fractions of enriched wine extracts from French Viognier wines with strong ‘apricot’ aroma. A series of sensory assessments to describe the aroma of various mixtures of several lactones, with and without the presence of other wine aroma compounds, provided further evidence that these compounds are of consequence to ‘apricot’ or ‘peach’ aroma in white wine. Several polyfunctional thiols that are very substantial contributors to the flavour of Sauvignon Blanc wines have been investigated for their contribution to the aroma and flavour of Chardonnay. As discussed in the previous annual report, 106 commercially available Chardonnay wines (price range $3 to $120, median $19) were sourced from across Australia, with wines also made under controlled conditions from Chardonnay juices sourced from 16 vineyards across multiple regions. From these two sample sets, virtually all wines had concentrations above sensory threshold for all of the thiols measured, with clear relationships between the levels of the thiols and important sensory properties of the wines. In investigating the data more closely, there were trends that wines from Tasmania had higher amounts of 3-MHA and benzyl mercaptan, while Western Australian wines had a higher median level of 3-MH. 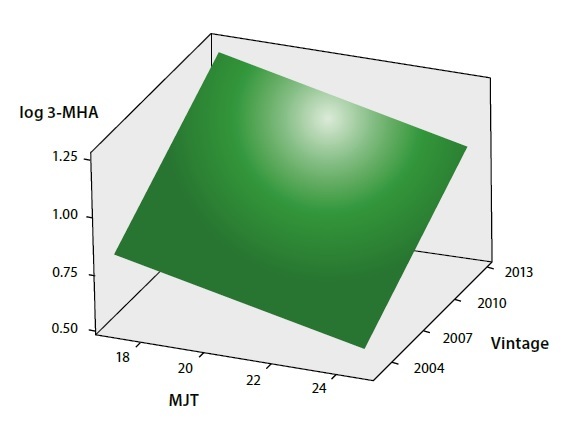 The concentration of the ‘tropical’/‘grapefruit’ 3-MHA was linked to cooler sites and younger wines (Figure 2), and the ‘struck match’ benzyl mercaptan compound was generally higher in wines from cooler regions, older and higher priced wines. Variation in rotundone concentration across a single Shiraz vineyard in the Grampians region of Victoria was mapped in a collaboration with Dr Rob Bramley of CSIRO, and results from 177 vines gave a very similar spatial variation pattern to that observed in the 2012 and 2013 vintages. This strongly suggests that the variability across a vineyard is related to topographic features in the vineyard. In assessing grape samples from vineyards in the same geographic area, many were found to have appreciable rotundone levels, with the concentration found to be significantly associated with bunch temperature measured in January 2016. No correlations were found with other compositional measures such as total soluble solids, grape colour or tannin concentration. To determine the chemical compounds that contribute most strongly to ‘green’ or unripe flavour in red wines, a sensory and instrumental analysis study was completed on 18 commercially available Shiraz wines. The wines were selected as exhibiting a range of ‘green’ aromas and flavours, and they were characterised by a trained sensory descriptive analysis panel with carefully defined attribute terms. The wines were found to vary widely in attributes such as ‘vegetal’, ‘stemmy’, ‘pepper’, ‘eucalypt’, ‘acidity’, ‘astringency’ and ‘bitterness’. The same wines were tasted by 20 winemakers, who applied a projective mapping technique, which involved sorting and grouping the wines based on their sensory similarities and differences. Asa final aspect of the sensory investigation, a subset of the wines was assessed by more than 100 consumers. The wines that were least liked by consumers had elevated ‘vegetal’ or ‘stemmy’ flavour, confirming that Shiraz wines with ‘greener’ attributes were not well accepted by consumers. Analysis of chemical data is still in progress. A vintage trial was completed with fruit from three different vineyards in Victoria and South Australia located close to vegetation. The study aims to assess the effect of trees planted close to vines on wine sensory properties and volatile aroma composition.